Have you ever shopped through TeleBrands? Maybe you're more familiar when I say "As seen on TV" products. I've seen and even purchased my fair share. Some were great...and well some were not so great. In this post I'm going to tell you about a few of their products that I was given the opportunity to check out for myself and share with you. First up is the Aqua Stone Humidifier. I was very intrigued about this one because we heat our house with a wood burning stove, which makes the humidity level in our house lower than normal. With the Aqua Stone I just fill it with water and it naturally does all the work for me adding moisture to the house naturally. What I really like about the stone besides that it's eye appealing is that it works without batteries or any need for electricity. We've used electric humidifiers and I really don't like how loud they are when running. And I've had ones that didn't automatically shut off when they ran out of water either, therefore wasting my electricity. I'm pretty excited about having the Aqua Stone as a more natural way to add moisture and plan to get a few more so I can put them in multiple rooms of the house. Aqua Stone is the unique new stone sphere that radiates water to instantly become a room humidifier! 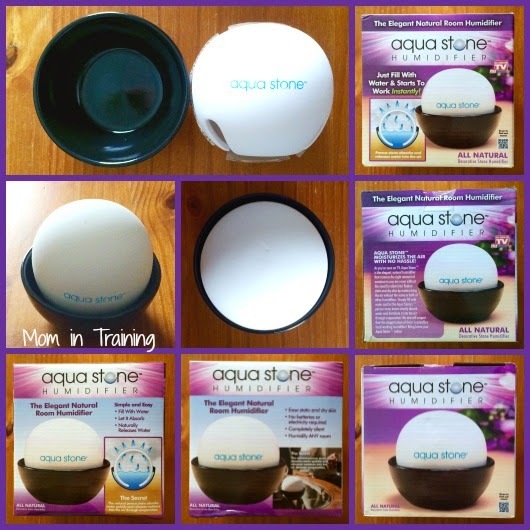 Simply fill with water, and let Aqua Stone go to work adding moisture to the air around you, the natural way! This decorative clay humidifier is completely silent and, best of all, does not need batteries or electricity. The secret is Aqua Stone's porous stone sphere that absorbs water through capillary action, and then releases it by natural evaporation, humidifying an entire room! And because there are no electric cords, you can easily place it anywhere in your home. Put Aqua Stone by the bedside while you sleep, on the family room mantle, in the kitchen or anywhere you need a constant source of humidity! Once water is added, just set it and forget it! Aqua Stone is just as effective in keeping the room humidified as a traditional electric humidifier, but without all the hassle of constant filling and cleaning. 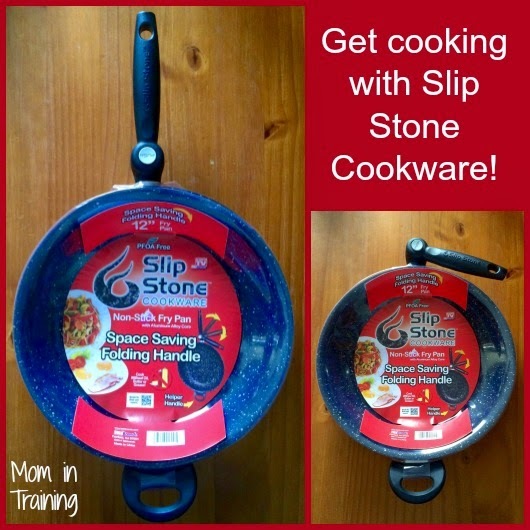 Another great product I got to try was the Slip Stone Pan. I've seen this one a few times on TV myself and always wondered just how well it worked. Well, now I'm here reporting to you that it does just what it claims. So far we've cooked eggs and fried potatoes in the pan and neither one stuck during the frying process. And when I was done cooking it was super easy to clean up the pan afterwards because there wasn't anything crusted onto it. I'm really looking forward to using this pan this summer when we go camping too because I always hated having a nasty pan to clean after cooking breakfast over the fire. The other great thing about this pan is that the handle has a cool button you can push and it folds in saving you space during storage. Rocky Mountain Slip Stone™ Cookware is the revolutionary, non-stick pan that looks & cooks like a real stone surface! With the Rocky Mountain Slip Stone Pan you can instantly stone sear meats or poultry to healthy gourmet perfection, without added oil, butter or fat - and no sticking! Gooey cheese or sticky chocolate wipes right off. Rocky Mountain Slip Stone is so durable you can cut food in the pan without worrying about damaging the rock hard surface! With its high-end aluminum and exclusive 4-layer stone-like non-stick surface, Rocky Mountain Slip Stone is made to look & cook just like real stone! The innovative folding handle allows you to store your Rocky Mountain Slip Stone almost anywhere! Just press, turn, and store and you'll save tons of space! Rocky Mountain Slip Stone is PFOA free, and like a rock, it captures all the juices, flavor and nutrients in every meal. Nothing tastes better than sizzling rock shrimp, sautéed vegetables, or crispy fried chicken that have all been evenly cooked in this non-stick stonework wonder! Buy it: You can purchase the Aqua Stone & Slip Stone Pan and other great As Seen on TV products online.